Prime Minister Sheikh Hasina yesterday reiterated that killers of Sonagazi madrasa student Nusrat Jahan Rafi will not be spared. "The perpetrators who burnt Nusrat to death will not be spared from the hand of the law in any way," she said when Nusrat's parents AKM Musa and Shirina Aktar called on her at the Prime Minister's Office (PMO) in the city in the morning, reports BSS. Briefing reporters after the meeting, PM's Press Secretary Ihsanul Karim said the Prime Minister mentioned that Nusrat set an example of bravery by sacrificing her life as she, till the death, protested the atrocities unleashed on her by the culprits. He said the premier consoled the family members of Nusrat and expressed profound sympathy at the tragic death of the madrasa student. The prime minister also assured them of extending all kinds of cooperation, the press secretary added.Nusrat's parents expressed profound gratitude to the prime minister for standing beside them after the incident. Nusrat's two brothers and Chairman of NRB Global Bank Nizam Chowdhury were present on the occasion. Nusrat, who was set on fire on April 6 by miscreants, succumbed to her injuries at Dhaka Medical College Hospital on April 10 night.Nusrat had accused Feni's Sonagazi Islamia Senior Fazil Madrasa principal Sirajuddoula of harassing her sexually on March 27 while she was exposed to his extreme vengeance on April 6 when she went to the madrasa to appear in the HSC equivalent "Alim" examination. 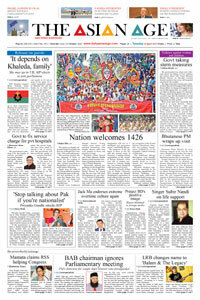 A group of masked youths, reported to be principal's stooges, took Nusrat to the rooftop of the madrasa and set her on fire in their bid to kill her.After the incident, the prime minister asked the law enforcement agencies to bring the perpetrators to the book and take stern actions against the killers.Earlier, the premier had directed health authorities to ensure best possible treatment for the 18-year-old Nusrat.